I am proud and honored to have been invited to participate in the WOMENS WEALTH program being held December 28th in Dover, DE. 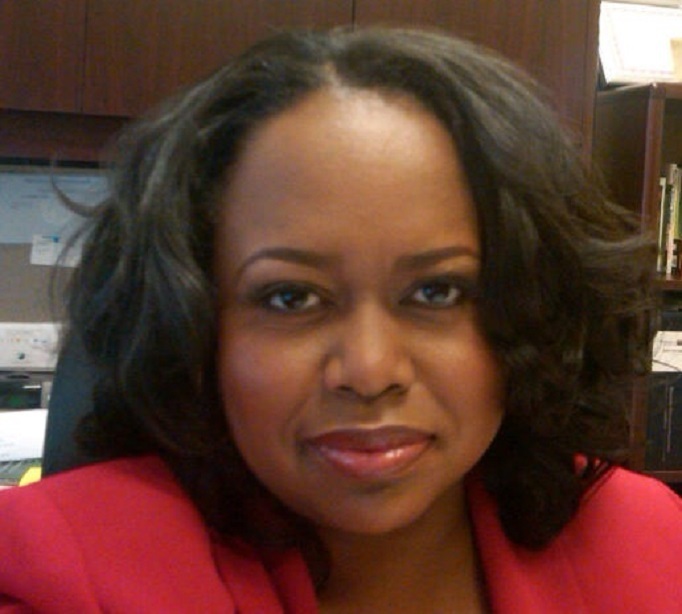 The #WomensWealth program helps women build wealth personally, professionally, emotionally, spiritually and financially, was founded by Tarra Jackson, known as Madam Money. #WomensWealth produces several online shows, Twitter chats and events nationally that focus on Wealth Building Strategies for Women Business Owners, Entrepreneurs and Professionals. 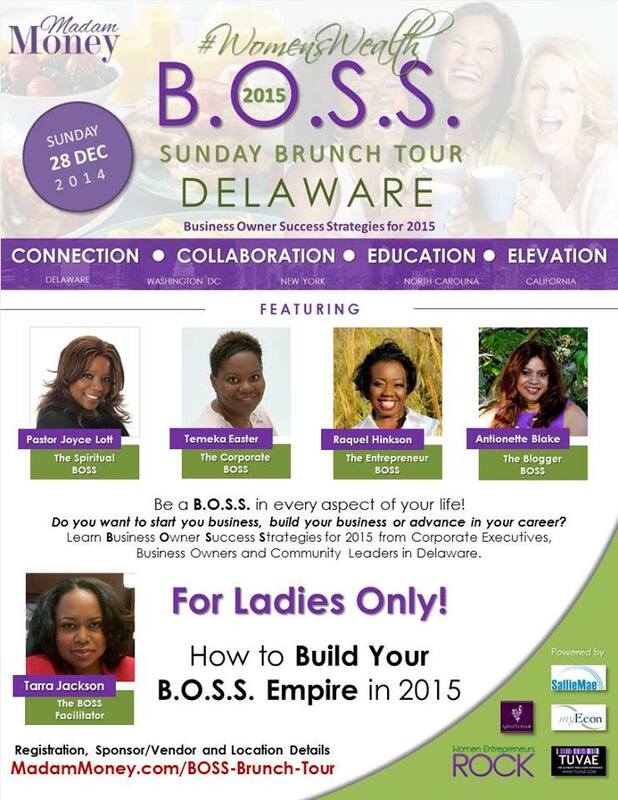 #WOMENSWEALTH presents THE B.O.S.S. BRUNCH TOUR and it is not your normal networking event. The B.O.S.S. Brunch brings a diverse audience of women together to connect, collaborate, educate and elevate one another while sharing Business Owner Success Strategies for 2015. #WOMENSWEALTH B.O.S.S. BRUNCH will host its kick off on Sunday, December 28, 2014, from 11am-2pm EST at Dover Downs, located at 1131 N DuPont Hwy, Dover, DE 19901. Tickets are on sale for $45 and can be purchased at http://www.madammoney.com/BOSS-Brunch-Tour (http://www.madammoney.com/BOSS-Brunch-Tour). This event will include a delicious brunch at 11am and a Powerhouse Panel Discussion will follow. The discussion panel will feature Pastor Joyce Lott (FreshBread Christian Center), Temeka Easter (Sallie Mae Social Media Director), Antionette Blake (DEDivahDeals.com Blogger), Raquel Hinkson (Author, Credit Expert and DE BOSS Brunch Host), along with some of the city’s successful women business owners, entrepreneurs and professionals discussing Business Owner Success Strategies and giving specific tips on how to a B.O.S.S. in 2015. The Powerhouse Panel discussion will begin at 12:30pm! The B.O.S.S. Brunch Tour is an opportunity for women to meet, mix, mingle, make strategic connections, ask questions, access helpful resources and above all enhance their Net Worth by increasing their Network! Each guest will receive a complimentary B.O.S.S. Gift Bag with gifts from event sponsors and vendors. Sponsorship and Vendor opportunities are available at the following B.O.S.S. Brunch Tour locations: Dover, DE (December 28, 2014), Washington, DC (January 11, 2015), New York, NY (March 15, 2015), and Raleigh, NC (May 10, 2015). Tarra Jackson, known as Madam Money, is a seasoned personal finance expert with over 20 years’ experience in the personal finance sector as a corporate trainer, loan officer and executive at several major financial institutions. Tarra is the author of the best-selling book “Financial Fornication” as well as a nationally acclaimed speaker, commentator, consultant, author, and syndicated blogger. Tarra is the producer of #WomensWealth Google Hangout and host of one of the top five ranked personal finance Twitter Chats, called #CashChat Fridays at 12PM EST. For inquiries regarding press, PR, event sponsorship, please email them to info@tarrajackson.com. Looks like another great event my friend. Have a Merry Christmas to you. I won’t be around for a couple of weeks. Thank you and I wish the happiest holidays for you and the fam- thanks for being my friend in 2014 and I look forward to seeing you in 2015! Happy New Year! This sounds like a great event! Kudos to you on getting that opportunity! Thank you, I feel blessed! You go BOSS Ladie. That is such an awesome event. Best wishes for an awesome event! Thank you, wish you could attend. Merry Christmas!